Romy: Hello, everyone, this is Romy, and we are here with another episode of the Bonfires of Social Enterprise. We have a very special artist, Grace Elizabeth Lee, at the end of this episode and an incredibly inspiring interview with Chris Lambert of Life Remodeled in Detroit. 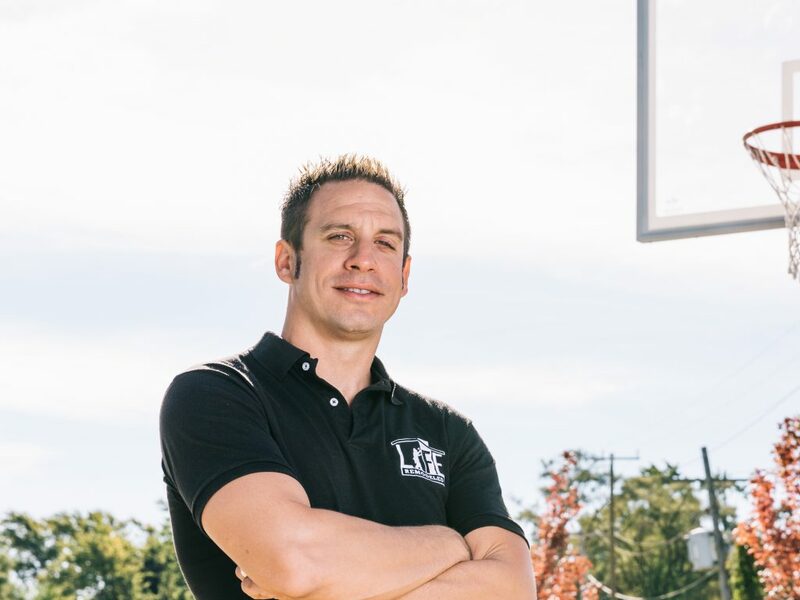 This guy and his team are pulling off miraculous transformation in the neighborhoods. Before we tune into the interview, let’s find out what Jentzen has prepared for our Fun Fuel today. Romy: Hello, everyone, this is Romy, and we are here with another episode of the Bonfires of Social Enterprise. We have a very special artist, Grace Elizabeth Lee, at the end of this episode and an incredibly inspiring interview with Chris Lambert of Life Remodeled in Detroit. 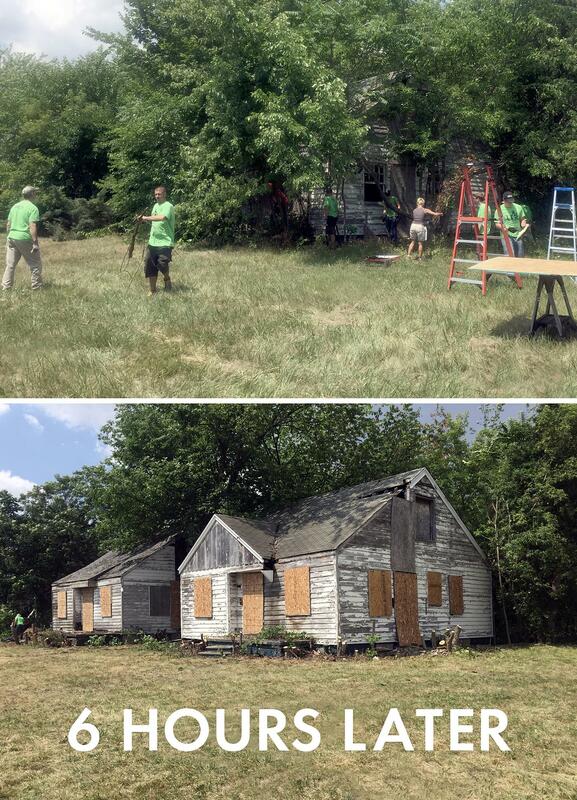 This guy and his team are pulling off miraculous transformation in the neighborhoods. Before we tune into the interview, let's find out what Jentzen has prepared for our Fun Fuel today. Romy: Thanks, Jentzen! It is funny how we can adapt words over time. I am glad the word tenderloin is mostly used for steaks these days. Okay, moving on to my interview with Chris Lambert. I have been reflecting on my interview with him and, while there were a lot of pieces that inspired me, I could not help but notice the combination of a boldness with a humbleness at the same time. Bold and humble, an incredible combination. I felt the wisdom and peace of a seasoned leader and the courage of a warrior willing to stand in protection of others. As you listen in to my interview with Chris, I am certain you will be inspired by his work in the neighborhoods, one block at a time. Romy: All right, so Chris, what is Life Remodeled? Chris: Life Remodeled is a Detroit-based non-profit, and our mission is we remodel lives one neighborhood at a time, and the way we do that is every year we choose a different neighborhood in Detroit and we invest about 5 million dollars in cash, labor, and materials and that's all based off of what are the community's needs, and what is the community's vision? We come alongside the community to achieve their vision and there's three main physical things that we do. Number one, we remodel a community asset, usually a high school. The second thing we do is we repair owner-occupied homes and thirdly, we cleanup 300 city blocks in six days with 10,000 people. Romy: How did you land on those three? Chris: Yeah, that all comes back to, again, the community's vision. Every community has an asset that needs improvement and that asset, when it's improved, makes a huge impact on the life of the community and in every community we work in Detroit, there's a lot of homeowners who have needs they haven't yet been able to meet for renovations, and then blight is one of the most significant problems in Detroit because blight is a magnet for criminal activity, so for instance, there are over 60,000 abandoned houses in the city of Detroit and those abandoned houses are more than just eyesores, but those are actually magnets for prostitution, human trafficking, and drug use, and there are real stories of children who have actually been taken on their way to school and bad things have happened in these homes. Then, of course, the tall weeds and the illegal dumping create a line of sight issues, so you don't know what's around the corner, you feel unsafe, and you literally can be unsafe. We tackle issues that are common and agreed upon by the community, but of course, it's unique to each community's specific needs. Romy: How did this start? Because I know sometimes big things are inspired by one or two small things, right? Chris: Let me start with my personal mission in life. I want to be this Jewish construction worker who lived about 2000 years ago, and he was brutally murdered and then came back to life, and in my opinion, he's alive and well and doing great things. At the time of starting Life Remodeled, I actually was the pastor of a church that my wife and I had started and I watched this television show that I used to cry every time I watched called, "Extreme Makeover: Home Edition," and even though I cried when I watched it, I loved the show. I came to learn that anywhere between 17 to 25% of families were losing their homes through that show within the first two to five years. The original concept for Life Remodeled was really in reaction to that show and we said, "Let's create something more holistic" and the original strategy was build a house in six days and give it away to a low income family for free, but also take them through financial training, set them up with a financial advisor, set them up with a clinical psychologist who can help them process family dynamics, offer spiritual guidance which they could accept or reject, and then the big differentiator was we wanted to invest in the surrounding neighborhood instead of just one home. All of that started with an idea in April of 2010. One year later, we completed a project with everything that I just mentioned and then it just blew up from there. Romy: How did you mobilize that into action in one year? Chris: Well, there's a few different ways to look at that, but let me start with the role that the church has played, and before I say that, I want to make sure I articulate, Life Remodeled is not a religious organization. We have actually established ourselves in a way that we are for everybody, right? Religious, non-religious, pro-life, pro-choice, democrat, republican, because we really want to bring everybody together. Everybody has something to offer, and everybody can contribute to the future of Detroit in our region and that being said, we partner with businesses, churches, all kinds of organizations and really the churches have been the hub for the overwhelming majority of our partnerships and our relationships. Because what's happened is I've been able to speak at a number of churches, and I've talked about Life Remodeled in the context of also preaching from the Bible, and light bulbs have come on for people because for all these years they've been sitting in church service, they've never been able to invite their company to participate in something with the church because of political reasons, but they realized, "Wow, I can get my company involved in this thing," and so they would leave the service, they would talk to someone in their company, whether they were a mid-level manager or an executive and then all of a sudden we'd get a phone call, and another company would join on board, but it's very much been word of mouth, relationships, giving people a great experience. One of the way we say that as a core value is it's all about people over projects. Our projects are exceptionally important, but people are priceless. People love the mission, but they love to be loved even more, and that really spreads very quickly. Romy: So, you view, part of your, I'd say, beneficiary is not just the people involved in the project, but the volunteers and partners? Chris: Yeah, so our mission is remodeling lives one neighborhood at a time, not remodeling Detroit. 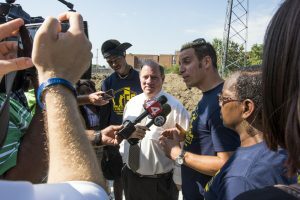 Detroit is where our focus is in terms of projects, and there's no question about it, the children, the students, the residents of Detroit mean everything to us, to me personally, but the donor in Northville or the business in Rochester Hills needs life transformation just as much as any student in Detroit or any parent. Romy: I've found that to be true so much since we interface so much with investors, other supporters in the social enterprises. I find the ones that I spend a lot of the conversation with are the funders or those coming to serve. Those tend to have the most transformation in the process of helping another. Chris: Yeah, it's an amazing thing, and that really changes philanthropy from being a one-way transaction to really an experience where all of us have something to learn and areas to grow in, and certainly you're very familiar with the divide between city and suburb that is still very real to this day. Much of what we do is about breaking down those invisible walls and the only way you can really do that is just to get people to know each other, and the work is the common value that people believe in and then when they work together, city and suburb, all of a sudden relationships are born. Romy: I feel like they're looking at a project instead of each other sometimes. Chris: They are, but the project then brings them to start to look at one another, so it's a great start to a beautiful relationship. Romy: Going back, did you have construction experience or experience in any of the three that you talk about? Chris: Let's put it this way, Romy. You do not want me working on your house. I worked construction for one summer in my college years, and my gift is I'm a connector. I can cast vision, and I know to stay in my lane, so I love inviting contractors who know how to do what they do, and they do it with joy. Romy: Yeah. They like serving in their specialty, but one thing I've noticed about you, and we haven't talked about this, is the people who go to serve with you feel protected because they feel like you're going to take the time to get to know what their needs are and how they serve best. Chris: Yeah. We say that we strive to be both organized and organic. The organized part is that our role is to make it, so the projects are plug and play for whatever a business's talents are that they're able to do what they do without having to add multiple layers to get to that. That way, they're able to really thrive at what they do best, and then they stay engaged and then the organic side is the relationship that develops in the process. Romy: Now, let's talk about ... We talk about what happened in that first year, but what's been some of the accomplishments so far? I'm going to direct people to your website, but what's been some of the accomplishments that have surprised you that you've been able to pull off with all of these people? Chris: Yeah, first I'll talk about numbers because numbers just seems to blow people away and it blows me away when I think about it but over the last three years, we've completed three 5 million dollar projects each year, and each of them had over 10,000 volunteers in a week that we cleaned up 300 city blocks in each of these three Detroit neighborhoods. We've renovated schools, built a park, built football fields, and repaired dozens and dozens and dozens of homes, and that has made a big impact on safety. In one neighborhood, in particular, we measured crime a year following the project, and it dropped in 10 out of 11 categories, including a 47% reduction in homicides. School enrollment has gone up, academics have seen improvement, athletics have improved, and those are great numbers, but nothing is more impressive to me than the life transformation that we've seen take place. Just one brief story which you can actually see if you go to our website, there's a whole movie made about Osborn and the main character in the film, her name is Pandora, and this is a documentary, so it's all live. We didn't know how it was going to turn out, but I'll give the movie away. I mean, Pandora, the first time we meet her she couldn't be any more against Life Remodeled than her very first interaction with us. She is a resident of Osborn who is the neighborhood we worked in in 2015. She had lost her son who was murdered just two years before us meeting her, and she was bitter, angry, depressed, and she looked at Life Remodeled as just some group was going to come in and do a bunch of talks, and not really do anything. Fast forward over a series of months; her life is transformed radically to where she becomes the number one advocate in the community. She starts inviting her friends, her family, her neighbors, and people come because when they see Pandora, they see a totally different Pandora than who they've known for the last two years, and they want to find out what in the world has happened to her. What happened to her is relationships, because she got to know people who genuinely loved her just the way that she was, and were patient with her, and worked her through a series of processes that was all about just loving her and helping her get to a better place in life and she's been able to acquire a job, she's been able to raise her daughter now at a much higher level, and she's an inspiration to everyone who comes to know her. That's really what it's all about. Romy: Oh, my gosh. I can tell there's probably lots of stories that have a similar thread, haven't there? Chris: Yeah. There are endless stories and it's interesting that the more time goes by, I learn their stories that I didn't even know about, because when 10,000 people are in one place, and they're getting to know each other, their just endless possibilities and that's the joy, is hearing those stories and meeting the people whose lives are impacted. Romy: Yeah, there's a ripple effect when you change someone's life. It's hard almost to quantify all the subtle things that happen. Everybody's trying to measure social impact, I know today, I know that's a pain point for people, but sometimes you just can't measure the transformation of a human heart, and when you're helping people have hope. Hope, to me, is one of those things that's a game changer. Putting people's eyes on hope and that love, it overcomes it all, right? Romy: What's next in line now? I mean, there's so many things I want to ask you right now, but let me stay focused. What's next in line for you? What's coming in this new year for you? Chris: Yep. Next year is Central High School, and the neighborhood surrounding Central. Central is the very first high school in Detroit. Central High School is also the location where just South of Central, the 1967 civil unrest began in that neighborhood. Next year is the 50th year anniversary of that historic moment which is an amazing opportunity to celebrate real progress. Also, Central is where the Nation of Islam started; it's also where the Black Panthers have significant roots. The high school has the largest number of Jewish alumni of any school in Detroit, so you have all of this rich history and then you've got the fact that Central is located close to Midtown, so as that development moves past Downtown and Midtown, it's in a really great position for future sustainability. The vision there, this came from the leadership at the school and Detroit Public Schools, is to build a startup business incubator. Think of TechTown in a neighborhood which doesn't yet exist, not until next summer, anyway. This startup, of course, will be a place where entrepreneurs of every sector, whether it's food or technology or healthcare or you name it will have a place where they can grow and develop and collaborate. They can get their free legal, their free accounting, but the unique factor will be that they'll be located in an environment with high school students where they'll have the opportunity to teach in the classroom or to apprentice students, and even we're talking with Detroit Public Schools about integrating their curriculum, the student's curriculum, with real-world ventures. Chris: Instead of just learning math, they'll learn finance from a specific example of one of the entrepreneurs and what they're going through. Romy: Wow. You've been working on this for a little bit, right, with these thought leaders? How did you land on entrepreneurship as part of this ecosystem? Chris: Yeah, because it's the same thing we do in every community. We seek to discover what is the vision of the leaders who are within the community, and this specific vision came from the principal of Central High School, and immediately I thought it was a phenomenal idea, and the more that we spoke with Detroit Public Schools Community District, and other leaders and community leaders, just the momentum really has grown, but for me, there was a big unknown. Would entrepreneurs want to take office space in a neighborhood when they can go to TechTown or Ponyride or some other great locations? As I've communicated this, recently to several entrepreneurs, their ears are pricking up, their eyes are getting wider, and they see the potential because it's a unique story. We all know about the great development Downtown and Midtown, but we all know how much the neighborhoods need this development, and the opportunity to work with students is developing the future, the workforce of our country. It's pretty amazing, and I'm excited to see it grow. Romy: Maybe for some of our listeners who don't know, Chris would you talk about the gaps in the neighborhoods? When we say Midtown and Downtown to some of our listeners outside of our area, those are the main areas that have gone under redevelopment, but when we say neighborhoods in Detroit, usually we're talking about places, right Chris, that don't have access to transportation? They're almost set aside; there's almost isolation there. Could you speak to that a little bit for our listeners? Chris: Yeah, let me put it like this. Detroit is a city that's about 140 square miles, and in the 1980s, we had a population of 1.8 million people. Right now, we're down to about 600,000. You can just envision what that depopulation has done to vacant land, properties that are sitting abandoned, and the neighborhoods are where the majority of people actually live. Not only do you see abandoned houses, but you see abandoned businesses, and you see unfortunately abandoned schools. We've closed down over 50% of our schools in the last few years, and so goes a school, so goes a neighborhood, and so goes the business community, and it's this cycle that if you drive through many of the neighborhoods, you would think that a natural disaster happened 10 days ago, but this took place over several years, and it's equal to a natural disaster on scale, but it's also solvable. Romy: What does that roughly equate out to in terms of miles or acres? Chris: That's a little over three and a half miles. Chris: Yes. Yeah, people are helping to change family trees and generations and the youth of our city have a voice, and so we want to help give that voice to the youth and see their desires and their dreams through to completion and that's a lot of what we do is find out what do the youth want, and then we come alongside them and help them do that. Romy: I love this idea of adding entrepreneurial and do it, because all of the places that we've traveled around the world as Gingras Global, that's just a key element. Jobs add hope, incubation of ideas give people hope because it let's them know that, gosh, nobody's really got it all figured out, but it's a place to get in and try it and fail safely, if you will, fail forward, right? Chris: Yeah, absolutely. I just met an entrepreneur from Cody High School which is one of the high schools that we recently served, and he pulls out this set of gloves for me, and he says, "Put this on your hand." I put the one on my right hand and come to find out it has Bluetooth technology, and you hold your fingers up to your ears, like your thumb up to your ear and then your pinky up to your mouth, and you can talk into your pinky, and you can hear out of your thumb. This kid, he's a 17-year-old kid, and it really does work. It's a phenomenal invention, but whether this thing takes off or not, he's an entrepreneur with a future, and so it's guys like him that we want to give the opportunity to. Romy: Yeah, I'm astounded at the amount of youth that is coming up with ideas, even as young as eight and nine years old that I've run into working in Detroit. I'm just blown away by their passion and their creativity and just what they can pull off, so this is super exciting. I think this is going to expand all over the place. What would be the really big, if you just let yourself dream big and didn't think about money or resources, what could it look like? Chris: Well, we're ready to start looking at other large urban US cities around the country, so we've started getting the word out that our radar is out there and we will just continue to invest in city after city, whether it's Chicago next or Houston or Pittsburgh, you name it, we're open. We just want to keep moving forward and inspiring men and women and teenagers across the country. Romy: Chris, what would you give as advice to somebody who's trying to do something in their community where they're looking to engage businesses and corporations and support? They've got a non-profit, and they want to do something. What advice could you give somebody who's newly approaching this? Chris: Yeah, I think that the first thing that comes to mind is just going out there and start doing it yourself. Live it and experience it through trial and error, and invite other people into that journey to experience it with you. Everything's about relationships, and if you have a project, then, of course, it's very important that when you invite someone into that experience that it's a grand slam, because it's like eating at a restaurant. If you eat at a great restaurant, you're going to tell one person. If you eat a bad one, you're going to tell seven. Putting that time and energy and effort into making sure that the project is well organized and then continuing to cast vision and invite and not worry about who shows up or if the money's going to come because I've found that the more I focus on resources, the less I focus on people, but the more I focus on people, the more the resources come. Romy: That's a powerful word. I think a lot of times they get it backward. I hear a lot of people say, "Gosh, I can't move forward" or, "I can't try that because I don't have the money," or, "I don't have this." Sometimes I really feel strongly it comes down to your faith in yourself, that it's okay to fail and try to figure a little bit of it out, but communication, boy, that puts [sav 00:23:07] on a lot of things sometimes. We're going to fall and skin our knees, but sometimes just communicating, "Hey, I fell down. Hold on a minute." It's communication, right, sometimes? Chris: Yeah, absolutely. It's all about transparency and being authentic and inviting people into an adventure. People want to give; they want to see change, they want to be a part of that change, and then they're willing to go through the trials and errors and all that comes along with it. Romy: I think there's a myth out there that people assume you're going to do it perfectly. People know it takes some trial and error, they know mistakes are going to happen, but they want to walk alongside someone who is going to be transparent. I think people are willing to get behind that all day long, right? Chris:... Opposite of what you really want to send, so live in the moment, relax, do your best to plan, but be open to what actually unfolds. Romy: Good words. Well, how do they find you on the web, social media? Chris: Sure, our website is LifeRemodeled.com. L-i-f-e-R-e-m-o-d-e-l-e-d.com, and our Facebook and Twitter handles are both LifeRemodeled. Romy: Excellent. Anything else you want to share with the listeners? Chris: I would just say thank you, Romy, for this opportunity. Thank you for the great work you're doing around the world in 90 countries, and looking forward to listening in and being a part of the conversation. Romy: Yeah, great. Thank you. All right. Romy: Thanks again to Chris Lambert and all of the hard working volunteers and partners of Life Remodeled. We look forward to helping you with your entrepreneurial launch activities and incubation in 2017.